OK, so this one, I'll post the brew sheet, but be sure to read the notes because basically I drained a ton of cherries and then loaded into the primary... Since they are CANNED, they are already pasteurized, so just keep sanitation good. 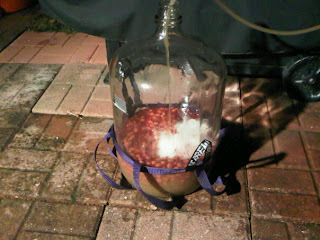 Drain cherries in sanitized equipment and add to primary fermenter. Rack off after 5 days into secondary. Since the 2009 Celtic won me a ribbon in the Strong Scottish category, I am hoping that I have at least one beer good enough to place here this year. We'll see.